Author Saylor Storm has been writing full-time for the past five years. Her current genre is suspense-romance, but she is now delving into non-fiction and the thriller genre as well suspense with a little romance. Interestingly, before turning to writing, Saylor ran a successful jewelry business and prior to that she was a professional look-a-like for Sharon Stone. Yes, she traveled the country to promotional events as the actress Sharon Stone for nearly 8 years. Saylor says one of her favorite memories of the gig was the looks she’d garner traveling through airports as her character. I had the opportunity to interview Saylor on my internet program, The DM Zone where I interview creative and interesting people from musicians as the Doobie Brothers to international artists like Ed Copley, the great-great-great grandson of John Singleton Copley. The interview was fun, and Saylor shares some little known facts of her life, and what is on the horizon in new books. 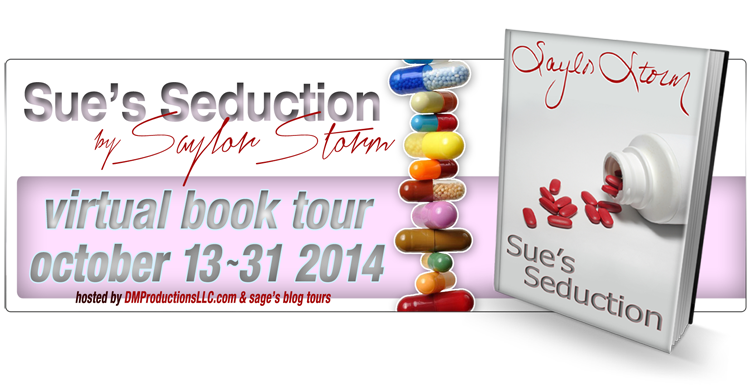 Saylor is on a Virtual Book Tour for her fourth and fifth books, book 1 and 2 in the trilogy SUE’S JOURNEY. 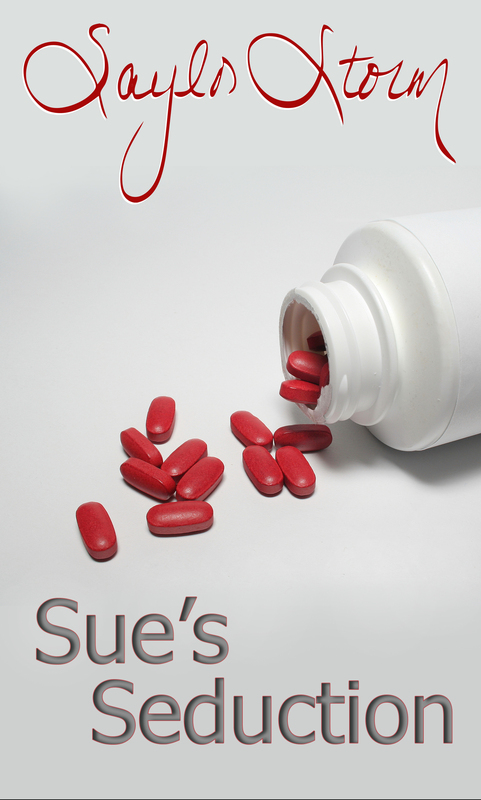 SUE’S SEDUCTION, book 1 grabbed my attention right away. The title character is not likeable at first read. Sue’s a complainer, and blames the world on her troubles. We’ve all met those types of folks, but just as I wanted give up on Sue, she’s introduced to a “magic pill” that is a fountain-of-youth. If she takes this pill daily, she’ll get younger and younger. 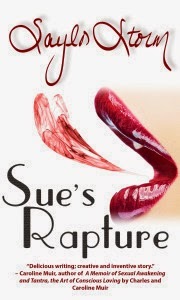 Here are the links to where you can purchase Sue’s Seduction and Sue’s Rapture. Enjoy! 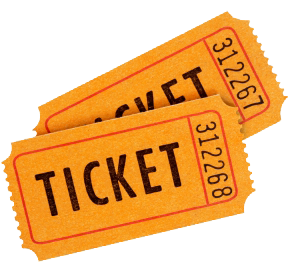 Virtual Book Tours – Now Add Video to the Party! As a publicist for authors, both self-published and those with publishers I have found that a Virtual Book Tour is an incredible tool for launching a new book. They can even be used for re-launching an older book that may not have gotten the attention it deserved when first released. I often participate in the Virtual Tours I help arrange because it’s fun. On Monday, October 13 I am posting for a Virtual Book Tour, but using video as my post for author Saylor Storm’s Virtual Book Tour. 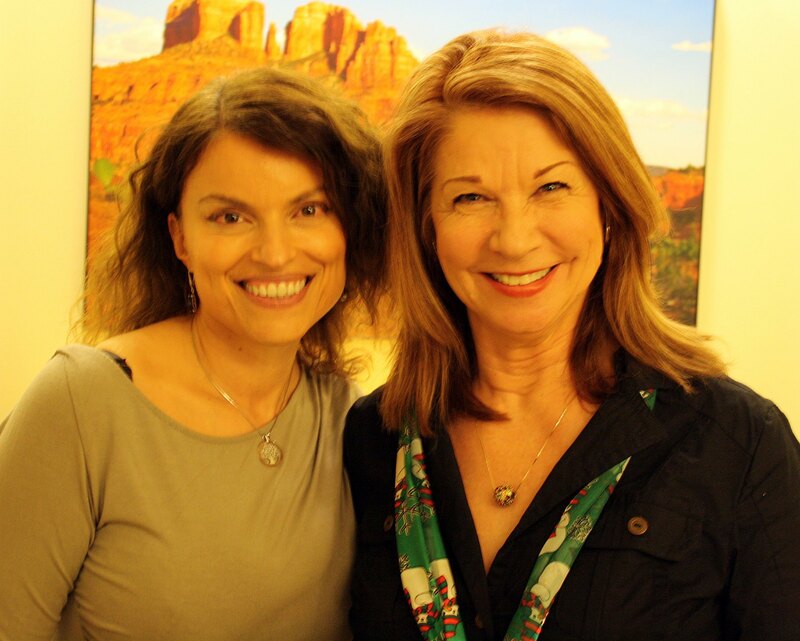 I interviewed Saylor at HD Broadcast AZ studios. We talked about her book, her writing style and whatever came to mind. It’s a way to get more eyes on your tour as video is more appealing in today’s market. You’ve probably heard that virtual book tours are a great way to promote books, but did you know that there are several different ways to showcase authors and their books through a virtual tour? Virtual book tours can include book reviews, guest posts on blogs, interviews on podcasts or radio shows, social network events, contests, book giveaways, and more. 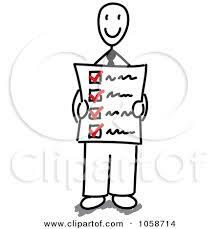 These tours are sometimes called book blog tours or virtual author tours, or abbreviated as VBT. I predict that video is going to be a new direction for Virtual Book Tours. Please come back to The DM Zone and watch a different way of participating in a Virtual Book Tour! See if you agree. Leave your comments. I would love to hear your opinions.